Just in time for Easter… Did you know your trusty BFF the Instant Pot can hard boil eggs? It’s true. The “5-5-5″ Method detailed on thekitchn.com yields perfectly cooked, easy-to-peel eggs every time. It’s my new way to do it, and I am betting it will be yours, too. I was skeptical at first, but became a true believer after I peeled my first egg cooked this way. Ready? Add water to the bottom of your instant pot, place trivet inside, and put eggs on top. Seal and set to high pressure for 5 minutes. After cooking, let instant pot release pressure for 5 minutes, then carefully release any remaining pressure. Transfer eggs immediately into an ice bath for 5 minutes. Be amazed. Oh, and use “older” eggs. Older = easier to peel. 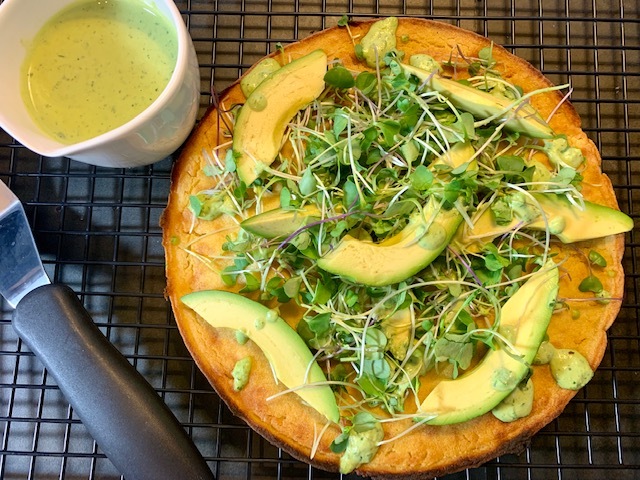 This Green Goddess Spring Socca from The Full Helping is just what your Easter table needs. Socca is delicious. It is gluten-free and also extremely quick and easy to make, provided that you have the batter set up and ready. You can do this by making your batter 30 minutes ahead, or if you want to make it further in advance you can mix it and keep it covered and refrigerated until ready to use. And that cast iron pan you’ve been loving so much lately is a rock star here. Socca loves this pan, and this pan loves socca. It will pop right out so squeaky clean you can whip out another batch. And another. The dressing included with this recipe is amazing. Green and fresh, it’s full of herby spring flavor from parsley and basil, brightened with a bit of lemon, and then tied together with tahini, giving it a roasted, nutty finish. You will have more than enough for this recipe so that as you are polishing off the last bit of socca and wondering why you didn’t make it sooner, you will thankfully still have plenty to experiment with on salads, sandwiches and veggie dipping escapades. I left out the agave/maple syrup altogether because I thought it was so darn good without it, but you be the judge. Slice, share, and enjoy. Happy Easter! Combine chickpea flour, water, salt, and 2 teaspoons olive oil in a small bowl and whisk until no clumps remain. Let rest and thicken for at least 30 minutes, or cover and refrigerate if making ahead. Place a 10 or 12-inch cast iron skillet into oven and preheat to 450º F. Remove skillet carefully using heat safe mitt or pot holder; add one teaspoon oil and swirl or brush it around to coat. Pour batter into hot skillet and transfer to oven. Bake for 10-15, or until set and golden. While socca is baking, make dressing. Check socca at 10 minutes. For a crispy top, heat oven to broil. Brush top of socca with remaining teaspoon of oil and move pan to upper third of oven, watching closely until socca becomes golden brown. Remove from oven. Top with greens and avocado slices and drizzle with green goddess dressing. Combine all dressing ingredients in powerful blender or food processor and blend until smooth.